Here is Season 1 Episode 2 of the Podcast, I talk about Halley’s Heroes and Jazz Fest and some other Denton happenings. You can also download the episode HERE to listen to later! If you have not had a chance to sample all the food here in Denton, you are not the only one, though your local Kiwanis chapter is here to help. Every year they host the Taste of North Texas where ou can sample all the good stuff. From some new places like Upper Park Cafe to some that have been here for years like Candy Haven and Milpa’s Mexican Restaurant and Cantina. That will at least help with most of your taste buds right there. There are many others that help this local event that benefits the Kiwanis Children’s Hospital. Now starting out, I was taking it slow, about half way through I was full. When they do an event, it is an event. With multiple vendors and restaurants volleying for your vote of the People’s Choice and Kids Choice, there was so much to choose from. TWU Catering had a lettuce wrap with chicken or tofu, while you had Palio’s and Mellow Mushroom with their fares which included a safe flavor and something a little different. Plus with a little music and some good conversation with the people there, it was a great time. There were some vendors out that were giving a taste of things to come as well. Upper Park Cafe is taking over the space where Samone Lounge, Gerheart’s, and Muddy Jake’s tried to fill. With a breakfast and lunch fare that will give the square another option for some upscale yet home style feel. Once you were done with the main course there was so many sweet options to choose from. The local favorite Beth Marie’s Ice Cream, Candy Haven, and opening in the new Denton Location in June was Sprouts to fill out your sweet tooth favorites from ice cream, cake, and jellybeans to win the Kid’s vote over. So, to say the least, my first time at The Taste of North Texas was one that filled me up. From the local barbecue to tacos, and ice cream to truffles, it was something I believe everyone should experience. You feel like you have done some good by helping a local charity and helping your hunger out by getting some good staples here in Denton. Well, here it is. Definitely not my best work but it is my first, so there was a learning curve on this one. Have a listen and keep your eyes on the page! New content to come. So in no particular order, here you go! Audacity Brew House Taproom– This is the first taproom brewery to grace the city of Denton, TX. I think they did a real good job in representing the town and the laid back atmosphere. Head that way and grab yourself a good beer, sometimes they even have some on tap that you can only get in the Taproom, so ask one of the taproom bartenders about some of those interesting beers that can only be found in Denton, TX. The Bearded Monk– Home to the first growler filler station, this destination has 21 beers on tap that you can take home. You know, those ones that you can never find in a can or bottle, yea, those. It also has an eclectic selection of beer and he also has the knowledge and you can check out reviews and some other fun things he does on his blog as well. Hannah’s– Just off the square, this is a place that is one of our best places considered fine dining. Yes, we have fine dining. This has one of the widest selection of fine wines and great food. Apogee Stadium– Home to the University of North Texas Eagles. This new stadium has it all. With a little over 30,000 seats, this stadium houses the best football in Denton, TX. Get there early for some good tailgaiting during football season! Rubber Gloves Rehearsal Studios– One of the places that music still resides and a great place for that small venue concert. Has some interesting stories as well. Oh, if walls could talk. Sweetwater Grill and Tavern– This is a great place for some great food. They have live jazz and music on the weekends and just a relaxing place to hang out. Great outside patio area as well when the weather is right. Paschall Bar– Here in Denton you will find some hidden treasures, this is one of them. With a speak easy feel and a relaxing fun environment. With some interesting libations and some great beer selections, this is one of Denton’s true hidden nuggets. LSA Burger– One of the best burger places here in the city. Great atmosphere and great food. Tr the Parmesan Fries, it is worth it. They are expanding and there is some live music as well on the upstairs patio, and you can sit on the Denton Courthouse lawn and enjoy that with some good friends and great weather. Dan’s Silverleaf– Great concert venue, fun relaxing and has been a Denton staple since 2002. You can catch some great local acts or some eclectic groups coming through Denton on their tours. Usually is a place that hosts many of the music festivals that come into Denton as well, like 35 Denton, Denton Art and Jazz Fest, and Oaktopia (which is always a good time). Guiseppe’s Italian Restaurant– Great Italian food with that romantic atmosphere created by the home that this establishment has occupied for years here in Denton. The lasagna is one of the best ones here in Denton, in my opinion. Barley & Board– So, what can I say about this one? Well, the concept is something you have to see. Very rustic and great food, the atmosphere is one that has a laid back sophistication. You can head there in a tie and slacks or shorts and a t-shirt. Great food and a great place for a good conversation among friends. Eastside & Oak St Drafthouse– This one is doubled up only due to how you feel at the time, both of these places are great, one is more a sports bar/ local pub feel, the other is a feel of sitting and listening to friends and conversing in your back yard. Owner John Williams has created a great atmosphere for both bars, I sometimes have a hard time choosing which one to go to, that is why I am always asking myself, “What mood are you in?” to get the decision made. So, with that said, that is why I combined the two. Midway Mart– Last but not least… What can I say about this place? Well, it is the most interesting entry on this list, it is a convenience store of fine fermented beverages. Servicing Denton for 20 years, this is the go to place for the interesting beer selections. Want to find some off the wall IPA or garlic flavored beer, they probably have it, maybe not the garlic one, but some interesting selections come through here often. If you subscribe to their twitter feed, they let you know about some of the ones that are not exactly on the shelf. Well, hope this is some help, comment if you think I missed any. I am sure that I did, this is a list that I like and think is a needed list for people to see, but I want to hear our opinion, what or who do you think should be on the list? And keep watching here for the new Denton Traveler Podcast on Mixlr.com. So, I know it has been a little while since I have written here. I am hoping this is a start of a regular time for me, Anyways, I am bringing you the reviews from the past weekend. My wife and I went Austin St Food Truck Park for the Food Truck Fest last week by Oak St Draft House and Eastside and boy was it packed. I was spinning in excitement with what all they had, from vegan and vegetarian options, to full on meat coma educing items. This paired with a good beer selection is a start of a great evening. and bacon topping the small burger of awesomeness. These guys know how to make a slider interesting and tasty. Looking at all the options, you just have to bring some friends and spread out, so for those of you wanting a wide selection, there is an idea, though might be a bit difficult to get your friends to share the goodness of what they ordered. Now there was one truck that had no food but still an interesting flavor, my local friends at The Bearded Lady. They can make sure your hair is trimmed and your beard is clean. With offerings of beard salves and balms and a stache dam that will keep that nice looking mustache clean from any beer that you might be enjoying. After a few glasses of the Oaktopia from Audacity Brew House, we headed over to end the night at The Bearded Monk, which had its grand opening that night as well just behind Eastside at 122 E McKinney St in Denton. Do you need an odd beer? Something you never had before? Head to Ben Easly, he and his crew will make sure you find something that will fit your needs and likes. They have guys that know their beer and ones that you can take home, and even get a growler to fill and head home with fresh draft beer, FRESH DRAFT BEER at home, just making sure you heard me. That’s right, the first dedicated growler shop here in Denton, TX. Oh, the uniqueness keeps growing. But definitely was a sight to see here in Denton. Hope next year will bring some of the old favorites back and some new tasty options as well. Check out these local places and as always support your Denton local businesses. They have some great offerings and some tasty fixings. Let your friends know and stay local. Hope everyone had as much fun as we did. This summer has been interesting and not as eventful as other summers in the past. I have been going some places and doing things, yet have not gone to anything major, unless you count my trip to New England to see my sister-in-law graduate from the US Naval Academy (go Navy, beat Army!). But I will simply say other than that it has been a bit quiet. Until news of a few new venues came out! There are now a few new things in Denton that should excite some of the local Denton natives, one is a craft brewers supply store, a growler filling station, and a new place on the square! With all that the city council here in Denton, Texas has made it possible for small breweries to move in the area, I feel like a little kid in a candy store! There is so much going on right here in Denton that it seems it might be looking to boom again. First off, I want to talk about the new craft brew supply store Baron’s Brewwerks, where has this been?!? In all honesty, I never understood why it took so long for someone to open a craft brew supply store. I would think that it would be a no brainer with the community and how many people brew in this area, the closest one I could think of was one in Richardson. Anyways, the owner is a great guy and a welcome addition to the Denton scene, with a great love of the craft and seeing he wants to help people find what he enjoys as well, this is a great addition to the community. Now, coming in right behind Eastside, The Bearded Monk, a growler filling station. I know, you can get some at Eskimo Hut or at the Chestnut Tree, but competition is healthy, plus, I want to be able to get some of the odd ones you see ar Oak Street Draft House and East Side, This will bring a new facet to the growing popularity of craft beer, especially in this area. Watch for that coming in. Next, we have a great possibility coming in where the Subway on the square just left, Barley and Board, started by some of the guys that started LSA, this project seems to be a bit high scale. A nice clean look, with that local flare. Love this concept and looking forward to checking it out, hopefully in the near future. Finally, the story that has been on everyone’s mind here in Denton, where are all these brewers going to fit in downtown Denton. There have been some concerns with the proposed ideas of breweries able to set up shop in downtown, one I somewhat understand, the overall atmosphere. I think the concerns that were mentioned in the article here have some validity. Denton has a certain scene, and to see that possibly skewed by something by trying to get business in can be a big risk. The concerns on smells and how it will effect the downtown area is a big concern, no one will want to come if it stinks. i know what all of you are thinking, “Charles, you like beer and Denton, why not mix the two, it just seems logical.” I like barbecue sauce and ice cream, doesn’t mean they are good together. My main point is, there are some industrial areas that can be used that are needing tenants, and just having them in the area would help out and be a great addition. I do believe that there is some room in the square for some distilleries and brewers. Denton city council needs to be careful with how they designate some of the areas. So, with everything going on, I feel this year is our year Denton, we are rising to something that might be able to see how Denton is growing in good ways. Hopefully bringing more jobs and life to this already fun little college town. With a new growler station, restaurants and other interesting things going in, this will be something to keep in mind. Keeping an eye out for all you Denton people out there. So grab all you can and watch for more posts here about the new places and reviews! I know I have been gone for a while and know that I need to keep up with some of these things. I also need to let you know I have been working on a top secr… well, not that secret, I have been creating a new company and trying to get my name out there. If you zoom over to Cup A Tech then you will see what I have been working on. This has been a long journey, if you want you can also see the Facebook page here. If you go, please hit the like button as a favor. I know, cheap plugs, I feel like a celebrity endorsing a book on The Tonight Show, “Yea Jay, I thought it was about time to do that.” But I am working on starting this and helping people with ways to increase their small business potential. I will still do some of this every so often, so it is still going to be around, I think that it will be fun and exciting. 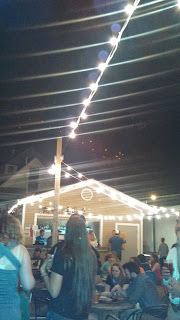 So keep checking the blog out and my other blog, Denton City Nights. I hope that you all have been finding spots and new places. There is soooooo much going on here in Denton. Our city council has done a lot to bring new business in and show the world what Denton can do. I am proud to be a Dentonite. With my guys at Armadillo Ale Works now have a beer in Kroger and VOTED the top new brewery in Dallas area, and new places such as East Side Social Club, Oak Street Draft House, Last Drop Tavern, oh how the face of Denton has changed. But always for the good. Check it out, let people know about Denton, TX, the best small town you ever will drive through. Here Comes The Summer… Deck It! So, I was talking with my wife the other day, we were thinking about all the places that have a deck or outside seating here in Denton. I realized there are so many places around the area that are great for sitting outside and relaxing with a great beverage, some food, or both. With that in mind, I decided to review a few spots we have been to and have enjoyed over the years when thinking about this great weather, some bars, restaurants, and local spots that have some great outside areas that make the summer experience even better. My number one outside spot is most likely Oak Street Draft House and Cocktail Parlor, where outside is the best seating and you can find some great drinks to cool off. Their outside seating feels more like a beer garden seating, with picnic style tables along with old cable spools turned into tables, chairs all over the place for lots of room. The owner, John Williams, has taken the Denton local feeling of a house party and turned it into a bar. With fun drinks including ones that have cucumber and other fresh flavors, look at their cocktail menu for flavors that you can definitely cool down with and relax. Now don’t forget to download their app on your phone to figure out what you want to have, with over 70 plus taps, it can get intimidating. With that said, they rotate out great seasonal beers that will have you trying many different flavors. Also, they have the local favorite on tap, Armadillo Ale Works Quakertown Stout. And don’t forget, John doesn’t mind if you grab some grub and bring it in, they have some menus from Mellow Mushroom and Weinberger’s Deli available if you get hungry while you are there. Speaking of Mellow Mushroom, this has to be my second favorite place. With a decent selection of beer and great pizza, their outside patio with a relaxing fireplace is a place to check out. Their artisan pizza is one of the best. With a unique decor and a fun atmosphere, this place is somewhere I frequent. With my friends or just me and my wife, we love this place. Great food and drinks to satisfy your pizza cravings. 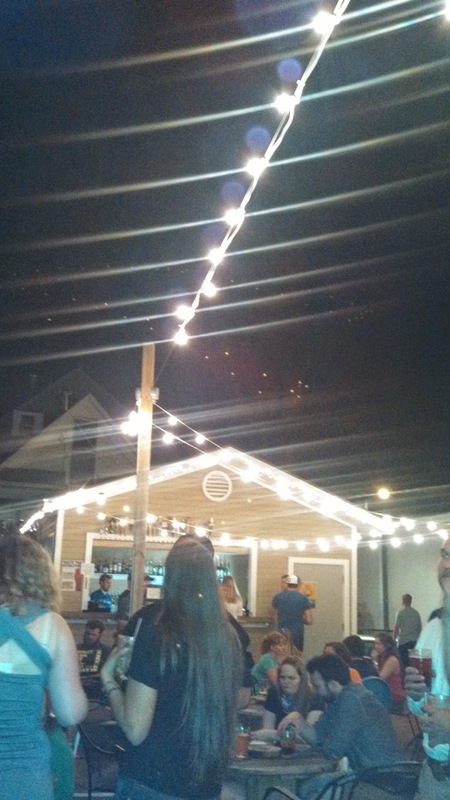 Another fun local place is Hoochie’s Oyster House, which has a great deck area. With good food, this place is somewhere to check out during the summer. Also, they host DentonRadio.com and local musicians on the deck that will serenade your time there. They have great seafood favorites at a decent price, oysters when in season, fish, shrimp, and combo platters that is great on a summer day. So, for all you out there, keep watching the blog to find new places. I will be posing about the best summer places and experiences. Keep an eye out, and check out some of the places this summer. Have a great one and keep cool. What do these things have in common? For those of you who know, it is the time for the Denton Art and Jazz Fest. Everyone has been trying to copy this but no one has been able to get that right amount of fun. Starting today, Friday April 26, through Sunday, April 28, is the spring festival that happens every year at Quakertown Park in Denton. With art and craft dealers, music, food and fun. So much to see with so little time, I have been year in and year out and figured out to go and look at the booths for the art and section it out. Get some food in and then sit and relax and listen to some of the great music. Now, on Friday is six time Grammy award winner David Sanborn, a jazz legend that has been around as long as I have been alive. 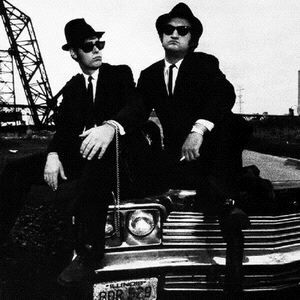 Then on Saturday night, the main attraction is the infamous Blues Brothers Band, need I say more? OK well the iconic figures that were first started by SNL veterans the late John Belushi and Dan Akroyd, they are still alive straight from NYC. Also, try to get in on the grand finale with Brave Combo who is currently set on playing five fests in two days, that’s right two days. Now of course, UNT always has their Grammy award winning One O’Clock Jazz Band, who is always fun to listen to. THere are some great acts on the smaller stages, one of which is on Saturday at 6, Fingerprints, who have a nice laid back feel for those who just like to sit and listen. So check out all there is and try and move around the stages to see all of the great music. So, to recap, Denton Art and Jazz Fest, April 26 (that’s today) through Sunday April 29th with food, music, fun, kid stuff, art, you name it. David Sanborn, Blues Brothers, Brave Combo. Anyone caught saying there is nothing to do this weekend in Denton will be slapped, okay, just reminded about Jazz fest. But come out, bring friends, have fun, be safe and remember to participate in the largest hokey pokey in Texas. Have fun. Well, a few notes for this week for all of you looking to do something. The Denton Square is having some visitors from Good Morning Texas, they are filming on Wednesday April 24 for a show they will be doing on May 2nd. They will be out at around 11:30 am -1 pm getting some stock footage. Next is the weekend most Dentonites look forward to all year, Jazz Fest. The stage is going up and the weather is looking great for the shows, I know I am excited to see The Blues Brothers’ Band Perform with one of the original band members there. I just loved the movie. Well, hope to see everyone there on Sunday night for Brave Combo.